This easy-to-assemble salad is sweet and juicy, big on flavour and makes a great light lunch or supper. Preheat the oven to 190°C, gas mark 5. Lay the trout fillets on a baking sheet and heat through in the oven for 5 minutes. Meanwhile, peel one of the oranges and cut out the segments, taking care to remove all of the bitter white pith and membrane. To make the dressing, cut the remaining orange in half and squeeze the juice into a small bowl. Stir in the horseradish sauce and olive oil, and season with freshly ground black pepper. Peel and slice the avocados. Toss them gently in a bowl with the lamb’s lettuce, orange segments and sliced olives. Divide the salad between 4 plates. Remove the trout fillets from the oven and break into large pieces. Arrange over the salad and drizzle with the dressing. Add a good grinding of black pepper and serve immediately. The trout may be served cold, if preferred. 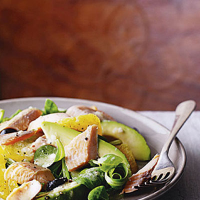 The orange segments and dressing can be prepared in advance and kept in the fridge until ready to serve. A white wine, subtly aged in oak, will match the smoky flavours of the trout.